This male belted kingfisher views the water from a favorite perch. When he spots a small fish, he’ll fly off and plunge head-first into the water to capture it with his thick, sharp beak. Kingfishers also hover in the air over water to spot fish. Female belted kingfishers are actually more colorful than the males, with a rust-colored “belt” below the black one that this male has. Now that it’s fall, many Westborough residents start filling their birdfeeders, but one bird that you’re unlikely to see at a home birdfeeder is a belted kingfisher. That’s because, true to their name, belted kingfishers (Ceryle alcyon) catch and eat fish – not your typical birdfeeder fare. Westborough is a good place for them for much of the year, with its various ponds and lakes, as well as the Assabet and Sudbury Rivers flowing from their headwaters here. To see a belted kingfisher in action – a sight that’s definitely worth seeing – you generally need to spend time on the shores of a pond or on a riverbank, or in a boat out on the water. The trails along the edge of Sandra Pond in the Bowman Conservation Area or along the edge of Mill Pond are good places to look for kingfishers. People who go fishing sometimes get to see a kingfisher doing the same thing but in its own dramatic style. The kingfisher isn’t competition, though, because it’s looking for fish that are quite a bit smaller than the ones most people hope to catch. Belted kingfishers themselves are only slightly larger than blue jays. Belted kingfishers typically watch the water from a favorite high perch on a branch or wire. Their keen eyesight allows them to spot small fish. Then they swoop into the air and dive headfirst into the water to catch their prey. Or they hover in the air – something many birds can’t do – to find a fish to dive for. Kingfishers are noisy birds. Often you can tell that a belted kingfisher is fishing nearby when you hear its noisy call. It’s a loud, long, rattling call, not what you’d probably expect from a bird. Because its prey is under water, the kingfisher apparently doesn’t need to make a quiet approach. Fishing and diving into water are special skills that young kingfishers need to learn and practice, just as human youngsters (and other beginners) do. The kingfisher parents give their young practice by dropping small dead or nearly dead fish into the water for them to dive after. Young kingfishers also catch slower-moving prey, such as water insects and crayfish. Just as we generally don’t expect a bird of the air to be diving into water, we usually don’t expect to find birds under ground, either. But that’s exactly where belted kingfishers nest. Not in trees or bushes or grass like so many other birds, or on the ground, or even in holes in trees – but in holes in the ground. And even more surprising, they dig these burrows themselves. The place that belted kingfishers typically choose for their burrow is a steep, sandy bank, such as you might find along a river, in a gravel or sand pit, or along a road cut or railroad track. The entrance is high, perhaps 10 to 40 feet up, away from predators and flooding. It’s usually about a foot or so below the top of the bank. Both the male and the female of a pair work on digging a tunnel about 3 to 10 feet long. The kingfishers loosen the dirt with their sturdy beaks and kick it backwards, out of the tunnel, with their feet. They progress about a foot a day. The tunnel slopes slightly upward, and at the end of it, the birds dig a foot-long hollow space. There the female lays about 6 eggs. Belted kingfishers use no nesting materials, but as they use the burrow, fish bones and other trash gradually pile up inside. Kingfisher parents take turns warming the eggs. Both male and female have “brood patches,” which are special places without feathers on their belly. Brood patches allow the parents to warm the eggs and newly hatched young next to their own skin. These brood patches develop during the breeding season in response to hormones. The young are born naked, blind, and helpless. They are raised in darkness for about a month until they grow feathers and are ready to leave the nest and fly. 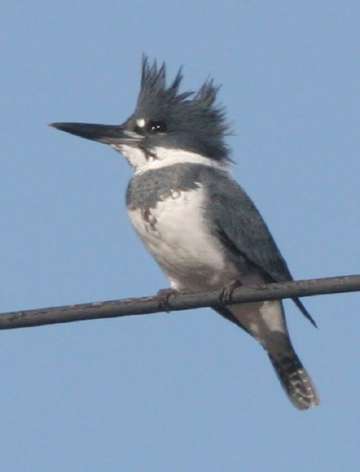 Next summer, look for belted kingfisher parents and their young around Westborough’s ponds and streams in the early weeks of July. The young are slightly lighter-colored than their parents and have shorter bills. Once the young have learned to fend for themselves, the parents drive them away. Many of our birds are leaving the area at this time of year, but you’ll probably be able to see belted kingfishers at least through October. They are territorial, so you can find them in the same areas day after day. Our belted kingfishers may stick around until our local waters begin to freeze over. Then they’ll move to open water farther south or along the coast. They’ll return in March or April when the ice disappears from our waters. What is the outlook for birds as specialized in their ways of life as belted kingfishers are? Like other creatures, they are affected by changes that humans make in the landscape. They need clear waters so they can spot fish. To breed, they need high sandy banks for their nest burrows. Human activity creates banks in sand and gravel pits and along roads, but development and flood control measures often eliminate steep natural banks along water. Recent breeding bird surveys suggest that belted kingfishers may be declining in number.